Happy 2013! 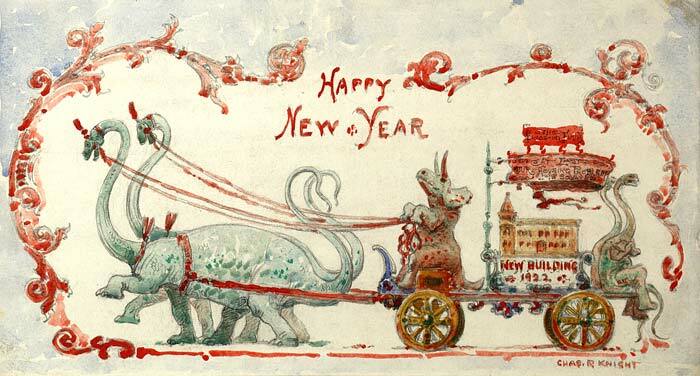 To celebrate, I thought I’d share this special New Years’ card. However, I didn’t choose this card simply because it depicted dinosaurs. I chose it because it was created by none other than Charles R. Knight. Even if you don’t recognize his name, it’s virtually guaranteed that you’re already familiar with his work (if not had your childhood ideas about dinosaurs shaped by his work). Charles R. Knight had a deep and lifelong appreciation for artwork depicting animals. His early days of copying book illustrations as a small child led to him attending art school and sketching animals at the Central Park Zoo. This in turn led to him visiting the American Museum of Natural History’s taxidermy department in order to study muscular structures, where one Dr. Jacob Wortman tapped him to aid in the reconstruction of an Elotherium based on fossils. Using a combination of what the fossils looked like, modern pig anatomy and some speculation, the end result so impressed Dr. Wortman that Knight was hired to create more paintings of prehistoric animals. His work was a hit and eventually he was creating more paintings for other institutions. But he wasn’t “just” an artist. He was even asked to both write and lecture about prehistoric life.